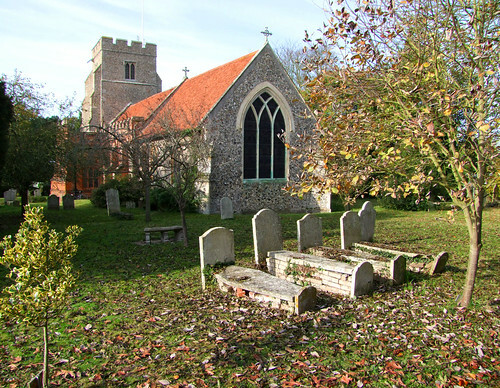 Kelvedon & Feering is a joint village, a large one, larger than some towns, but undoubtedly a village in character. The continuous High Street of both is the old A12, which bypassed it as a dual carriageway to the east in the 1960s, but it still seemed pretty busy to me. The two parts are historically separated by the infant River Blackwater, although more practically separated by the Norwich to London railway line which runs alongside it. This makes it sound hellish, but actually it is very pleasant, with some good late Medieval and Georgian domestic buildings. The two parish churches are at the westerly and easterly extremities of the village, the station about halfway in between. I'd heard Feering church was locked without a keyholder notice, so by ringing around I had found a contact number for the Feering keyholder. I'd arranged to meet her at ten, but a delay in getting into Kelvedon church made time tight, so I was glad I had found little to detain me there! I hurtled along the high street, over the river and under the railway line to a pretty village-like enclave where stands All Saints. Open. I noticed that the church now displays a large and welcoming keyholder notice in the porch. This is a handsome church with a wide nave and castellated walls, but with a beautifully mannered red brick south aisle which reminded me of Kenton in East Suffolk. It is difficult to believe that, as recently as 20 years ago, Feering was a star in the Anglo-catholic firmament, largely thanks to the incumbency of a traditionalist Rector who had been there for many years. I had not heard its name mentioned in such circles in recent years, and so it was no surprise to find a place which I immediately thought was really in danger. For the first time today (it would happen once more) I felt the sense of a church slipping away from us. The keyholder was magnificent. She was elderly, but her frailty was mixed with a great intelligence. I ended up staying here almost an hour, mostly chatting with her. She had lived the Anglo-catholic movement since her childhood in the 1930s. She knew she was in its last days, and told me that she had no wish greater than to become an anchorite! The church was by no means as interesting as she was, but it was still much more interesting than Kelvedon - not difficult. The star here is the range of English and continental medieval glass collected and placed here during the incumbency of the aforementioned rector. There is half a medieval sculpture of St Anne, a rare survival. There is also a photographic copy of the Constable 'Raising of Lazarus' altar piece which is at Dedham. I recognised it instantly, having been there two weeks ago. The painting had originally been in Manningtree church - Constable also did altar pieces for Nayland and Brantham churches. When Manningtree church closed in the 1960s, the Rector of Feering offered to buy it, and was offered it for the princely sum of £150! For thirty years, it was displayed in Feering parish church. The Rector bequeathed it to the parish in his will, and then in the late 1990s it was sold to raise money for the restoration of the church. It is now on permanent display at Dedham. I was glad to see Feering church inside, because I am sure it will be declared redundant in the next ten years. I left the village to the north, and soon gained open if somewhat hilly countryside.